The Clay Lift Set has two double-ended tools with sharpened stainless steel spoons contoured for easy insertion, lifting, and removal from moist clay. Instructions are also included with each set. This set makes possible the creation of many new decorating patterns and varied effects previously difficult to obtain, such as bird feathers, flower petals, and fish scales. 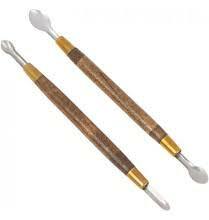 The spoons are firmly held by solid brass ferrules to smooth wooden handles. Each tool is approximately 7″ long.